Another answer I give to the question of “How is Rolfing® SI any different from massage?” is that as a Rolfer™, I strive to serve my client to the highest degree that I can, and massage is a tool that I sometimes use. But it does no one any service if I decide to meet every situation I encounter with a single tool. 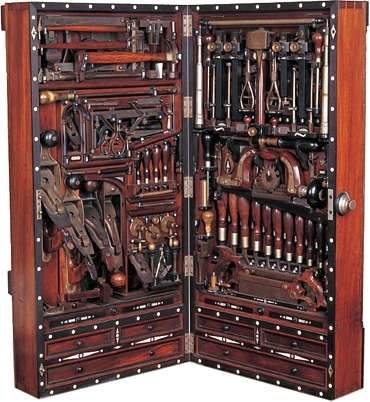 To use suboptimal tool for a given job is an activity that we can all imagine: consider building a log-cabin with a screw-driver…. My responsibility is to possess, polish, & employ as many tools as possible to serve my clients best. It’s no good with no selection, it’s no good if they are rusty, & it’s no good if I’m not willing to wield them. Massage is a tool; an instrument towards a given end. But it is not the end itself. The pointing finger is not the Moon. My charge is to wield the tools for what they’re worth; no more, no less. The particular end through Rolfing SI® is to evoke a condition of uniform brilliance in the client’s being. If bone-scrubbing with an elbow is the best means thitherto, then so be it. But usually there are better ways. Contact, imitation, words, movement, imagery, etc…at The Way of the Elbow headquarters, we strive to keep the tool-chest stocked.